We are digging up the garlic today. Over the past month, we have been occasionally testing the garlic by digging up bulbs (and eating them!) and the crop is ready two weeks early. We will leave the garlic bulb attached to the three-foot long stem for about a month while the garlic dries. We will store the garlic in a covered shed where it is dry. Freshly-dug garlic is delicious to eat now; we dry the heads so that the crop will last throughout the winter. Each head of garlic weighs more than a quarter-pound (and tastes better than a Big Mac! 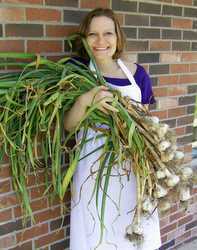 ).Why grow garlic when it is so readily available year-round? Taste the freshly-dug garlic and you may not return to eating supermarket garlic. The commercial garlic available now in the supermarkets was dug last summer, so it is dry and bitter. Garlic is an essential ingredient in so many delicious foods that the quality of this flavoring should not be taken for granted. Homegrown garlic cloves are as significantly better tasting as homegrown tomatoes. If properly stored (cool, dry, dark, and not in the refrigerator), the garlic should last until next year’s crop is harvested. The freshly-dug garlic is now available at Kitchen Conservatory. We’ve trimmed the stems and roots so it looks too beautiful to be real. I’m on my way … save some! Question: So obviously this is ‘special’ garlic but should it be treated specially too? Like only eaten in raw form or only in cooked form? or never roasted? or roasting is particularly good? or? or? Some tips would be appreciated! Those heads are as big as a fist! Our garlic is special because it is fresh. Most people have never tasted freshly-dug garlic and the difference is as dramatic as a freshly picked vine-ripened tomato compared to a tastely commercial tomato. The papery garlic in the supermarket was harvested last July and kept in storage. Fresh garlic is juicy, not dry. Use the garlic just the same way in recipes: eat it raw, cooked, roasted, minced, or whole. Fresh garlic is delicious any way it is prepared. And yes, a little goes a long way. I found your blog via Alanna’s post about her homegrown garlic on A Veggie Venture, and I’m looking forward to reading more. Your garlic is gorgeous–congratulations on such a beautiful crop. I’m getting ready to dig mine up, and I was surprised to see that you harvested yours while the tops were still green rather than letting them dry out and turn brown. I’ve never seen/read this before. Do you always harvest it green? Two years ago we harvested the garlic too late: the tops were brown and the cloves had started to separate from the head. The garlic did not keep well. So now we watch the garlic closely and as soon as the heads have plumped up and divided into cloves, we dig them up. In order to store the garlic so it will last through the year, we leave them on the stem for about a month to dry. Then we cut off the heads and store in a cool, dry, dark, and breathable space. By the time June rolls around, I am so anxious for the fresh garlic, I cannot wait for the leaves to brown! Thank you for your comments. I harvested a second group of garlic plants AFTER the greens died back and there were a couple of heads, yes, which had separated and were really not useable. So I’m also definitely in the camp of harvesting while the leaves are still green. I have just dug up one of my garlics as the leaves were turning yellow and the garlic looks like a leek not like a bulb at all why? it smells like garlic!! It’s a little early to dig the garlic, because the bulb has not yet separated into cloves. You are right, it looks like a leek. Leave the garlic in the ground for another month or so, and then it will look like garlic. I don’t know why your garlic leaves are yellow at this early date; do they have enough water? Hi there! We live in North Carolina and planted garlic last fall. The leaves were turning brown (I’d heard that it’s time to harvest when the leaves are 60% brown). I got a few really nice bulbs with good cloves, but many had a greyish moldy looking stuff on them. I took them inside and washed them. Most of the bulbs have now been separated into individual cloves without the thin paper. What’s the best way to store these cloves? Peeled garlic cloves have a much shorter shelf life than unpeeled heads. I suggest refrigerating them and using them as soon as possible. We do not wash or peel our garlic, but let them dry with the dirt, because then they will store well. I don’t know about the mold on your garlic; I have not seen that. Instead of just looking at the color of the leaves, we periodically dig up a garlic head to see if the crop is ready. The garlic is ready when the bulb has separated into cloves, but before the head starts to break apart and reseed. Whole heads of garlic keep better than individual cloves. Thanks very much! Would you store the peeled cloves in a ziplock or air tight jar, or would it be best to keep them open? Store the peeled garlic in a dry, sealed container in the refrigerator. I live in Maryland. Is there any reason I can’t try planting garlic now(end of May) I know that this isn’t the typical time to plant. Am I wasting my time or is it worth a try? I live in the northeast corner of Alabama and have moved to a house in the country. There was garlic already here, it now has purple blooms on it. When do I harvest it and how do I make sure there is more next year? Your climate in Maryland is similar to St Louis. Here we plant in mid-October and dig shortly after July 1…after the leaves start to die back. You will not get much garlic if you plant now. You can get planting stock from http://www.alphagarlicfarm.com. To plant: till the ground, fertilize with 12-12-12 (nitrogen, potassium and phosphorus), and plant cloves on 1 foot centers with rows 1 foot apart. Plant each clove so the top of the clove is the the debth of the length of the clove. Plant with the root down. The root end is the flat end of the clove. Cut off the flower or scape to produce bigger cloves of garlic. Dig when the leaves die back. Do a test dig to see that the head has separated into cloves. You can save back the seeds that are in the pod at the end of the scape. Garlic is a 3 year crop: plant seeds, harvest small cloves, replant, harvest medium cloves, and then plant again to grow large ones. Or order planting stock from http://www.alphagarlicfarm.com. Plant garlic cloves in mid October and dig in early July. Till the ground, fertilize with 12-12-12 (nitrogen, phosphorus and potassium), plant in rows one foot between the cloves in rows 1 foot apart. Plant with the flat (root) end down. Plant so that the top of the clove is at the debth of the length of the clove. We just picked our Garlic and it had small cloves with small roots that were attached to the large clove bunch. Do I save those cloves and plant in October and if I do, where do I store them until then. We live in Tn two hrs northwest of Nashville. 1. dry the whole plant (after knocking off the dirt; do not wash) with leaves, head and roots for about two week out of the direct sun. 2. cut of the leaves about 3 inches from the top of the head. 3. leave the roots on. 4. DO NOT SEPARATE INTO CLOVES. 5. store in a cool basement. 6. when are ready to plant in October, twist of cut off the roots, separate into cloves and with no delay, plant. when you remove the roots it is better to leave a “stub” of roots rather than damage the clove by cutting to close. Thanks for your quick response. I have cut the roots off the bunch of cloves and placed them in my dark closet in my laundry room as I do not have a basement. I am going to use those to eat. I was asking about the small baby cloves that were attached to the whole clump. Can I plant them in October? They each had a small root attached to them. I eat the small cloves and plant the large cloves. The larger clove will produce a larger, healthier plant next year. Make sure that you separate the garlic head into the individual cloves before planting. I checked our cloves and see that they have started to seperate. I have not washed or peeled them yet nor have I detached from the stems. I have them stored in our laundry closet that really is not too cool as a basement. Can I still leave them in there or where can I store them? We live in the northwest Tennessee. I plan on planting a few of the cloves and the rest we are going to eat. I do not wash the cloves until I am ready to use them. Store the garlic in a place with good ventilation. Eat the small cloves and plant the large cloves. Do not separate the garlic heads until you are ready to eat them or plant them. Ok I am a total novice and lucked into a house with garlic growing. I don’t know what the top bulb is about. I have long stalks that suddenly have these bulbs on them that seem to be full of small seeds and have all split open (I’m so naive I thought that was the garlic head!). Do I leave them alone or cut them off? The garlic hasn’t been tended in at least 3 years so there is a lot of it. I love garlic so am actually excited but just am unsure what to do now. Thanks! The “bulb” at the top with the seeds is actually the flower. It should be cut off. Letting the plant flower means that the garlic head in the dirt will be smaller. Dig up all of the garlic, because it is ready to eat! This is my second year growing garlic and I have a beautiful bumper crop. I am worried, though, that some of the inner cloves are smelly, brown and have small white worms eating them. I’m hoping that most don’t have this, as it surely won’t store over the Ohio winter. Garlic seems so robust, is there something I can do to prevent these pests? 1. There is nothing, I can think of, to be done for the infected heads. I have never seen or heard of this. 2. Would it be practical to open all the heads to find and discard the infected ones? 3. If you do this, the separated cloves will not keep well over the winter. Get ready to eat lot of it before it sprouts. We have found that garlic will keep, as heads, in the dark and cool (NOT in the refrigerator) until about March. 4. Ask your planting stock vendor about this problem before you order from them. 5. If you are growing as organic, check your mulch and compost. 6. We use a “Red Dragon” brand flame thrower on our seed beds to kill weed seeds and to “sterilize” the top few inches of the soil. 7. If possible, move next year’s crop to a new location. Can I plant cloves from the garlic I buy at the store or do I need to buy special cloves at a nursery or garden center? Garlic from the supermarket will not yield a good crop; usually they are treated not to sprout. Supermarket garlic is the soft-neck variety. I recommend buying hard-neck garlic from a local grower. One clove will yield one head of garlic. Plant Now! I had a fairly large crop of garlic last summer. Tops provided enough opportunity even to braid! They were hung in a spot in my garage. However, when I tried to use it during the holidays, most of the garlic heads had completely dried up and all was lost! Needless to say, I want to learn from my mistakes and not have a repeat catastrophe! What do you recommend? What happened? Although we think of garlic as a dry, pantry staple, homegrown garlic should be eaten fresh. My guess is that the temperature and humidity in your garage were not optimal for garlic storage. When we harvest our garlic in July, we start eating it, because it tastes so delicious when it is juicy. By January, what garlic is left is dry. Use it or lose it! Can I plant a garlic clove indoors now and still get a bulb? I missed planting it outdoors. I am in Pennsylvania. Also, what size container do I need? It’s long shot, but worth a try. Use a one-gallon container for each clove (like a milk jug — punch holes in the bottom for drainage). Be sure to plant the clove root down, stem up, about 6 inches deep in the dirt. Thank you for your comments, but it would help to know what your growing zone is in order to answer your question. Generally, a little yellowing is okay; perhaps your soil is too dry? I am in the United Kingdom. I have had to harvest my garlic because the weather suddenly turned incredibly wet..but the leaves had started to die back anyway and were laying down. I have been drying them for a few days, then due to storage space problems, I cut the leaves down by about half their length. Will this adversely affect the ability of the garlic heads to be stored over a period of time? After drying for about 2 weeks in warm (28 degree C) dry area out of the sun, cut off the leaves, leaving about 5-7 cm of stem. Brush the dirt off the head and roots; do not cut off the roots. Store in a cool less than 20 deg C. dark place. Do NOT store in the refrigerator. Our garlic will last until about March of the next year. By then we are eating the new growth from next year’s crop. We are at 38,39 north and 90,38 west (St Louis, Missouri, USA. We grow recombol (hard neck) garlic, planting on October 20 and digging on about July 4. The heads are 70-90 grams with a single row of 5-7 cloves. Our best results are when we fertilize with 12-12-12 and ammonium sulfate. What is your location and results? I currently live in the Dallas/Ft. Worth area of TX. The dirt here is clay and is painfully hard to dig in to. The past few years I have been trying my gardening skills with potted herb plants that I can cook with. I would love to grow garlic as I use so much of it cooking. Can it be done in pots or should I expand my gardening skills to mother earth? As for drying, they don’t have basements in Texas and I believe a shed or garage would be entirely too hot to use for storage. Would the kitchen pantry work, the house temp is about 78 degrees. I also read that garlic can be stored in sand or rice. Any suggestions on that? The type of fertilizer you recommend (12-12-12) is that something premixed in a bag or something you have to create? Really appreciate the website and your input. Thank you! Great questions! Garlic is difficult to grow in pots because it needs space, about a foot. (One large pot for each plant.) People I have known who have tried container garlic have not been successful. I would recommend a raised bed. A well-ventilated pantry should dry the garlic nicely. Just make sure that the garlic doesn’t sweat. Why do you recommend hard-neck varieties over soft-neck? What are the advantages/disadvantages. We are in temperate Western Washington. We like hard-neck garlic because it tastes better, is more pungent, has larger heads, and the cloves are easier to peel. I’m sure that you will have no trouble growing garlic in your area. The advantage of soft-neck garlic is that it can be braided. The stem of hard-neck cannot be braided. My garlic did not flower, yet died down so we dug it up. The bulbs are not separating even after 2 weeks in the dry air. Is this normal? Can I store it if it hasn’t separated into cloves? When did you plant the garlic? Garlic needs to be in the ground for 8 months. I plant in October and harvest on July 1. We planted last fall and dug it the end of August. 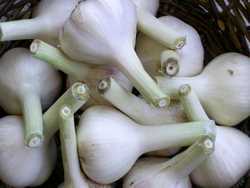 Garlic bulbs divide into cloves in the soil. The best way to keep garlic is to keep the heads whole. Individual cloves of garlic do not store for very long. My bulbs did not separate into cloves! They look more like onions but smell of garlic! I planted individual cloves and got bulbs~ Can I use it or did I wind up with some morphing thing?!? 3. Is your soil heavy or light? 4. Did you plant hard-neck or soft-neck garlic? 5. Did you plant the garlic far enough apart (we plant on one-foot centers). Did you plant in the ground or in containers? 6. Does your garden have enough sunlight. Garlic likes full sun. I think that something went awry with your growing conditions. Don’t give up; plant the garlic cloves in October. I like hard-neck garlic. I live in SE Washington in the high desert. Our soil is very sandy and we have much full sun. I composted and fertilized along with my other plants. The cloves were planted on 1 foot centers last fall. I’m not sure what type I planted! If anything, it may not have gotten enough water as our soil leaches and evaporates quickly. Have you ever had a single giant clove? I have, for the first time, had my Italian Garlic form huge baseball sized bulbs. I live in Ontario and this is my first time planting garlic. Because I missed the fall planting, weeks ago I planted in pots so I can transfer outside when weather is ok. Will this work? They seem to be growing quite fine. Do I wait till they are planted in ground to cut off the long stems they are growing. Thank you. Cindy, I don’t have much hope for your garlic plants. Garlic needs vernalization (time spent at low temperatures) in order to produce. Instead, get ready to plant garlic cloves this fall! Also, never cut the the long stems until the garlic is harvested. The part that needs to be cut off is the flower stem. All the garlic I have been buying lately has been sprouting within a week or so after I buy them from the store. Do you know what is causing this and if I could just take some of these sprouting ones and plant them in a pot on my window sill? I noticed in someones article that their is growing seasons based on zones; do you know what Vancouver BC is? I live in Houston, Texas where we don’t much of a winter, especially this year! It’s been in the low 70’s! I have some whole garlic cloves that were hidden & they have roots on them. Can I plant them outside or is it too late? Garlic is planted in the fall and winters over because it needs vernalization (time spent in freezing weather). I don’t think your climate is optimal for producing garlic. Try sweet onions instead!